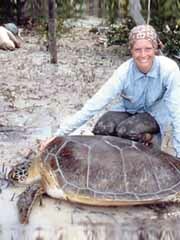 Karen A. Bjorndal is an internationally renowned sea turtle biologist and leading authority in nutritional ecology of herbivores. Bjorndal’s research program in sea turtle biology has focused on the role of nutrition as a regulating mechanism for growth and reproduction in sea turtle populations. For 25 years, Bjorndal has evaluated nutrition and growth in a population of immature green turtles in the southern Bahamas. The long duration of this study has allowed her to evaluate density-dependent effects on production – a previously unstudied phenomenon which is critical to an understanding of population demography and recovery. Now, she is working with colleagues in Australia on a comparative study of nutrition and growth rates in green turtles in the Bahamas and Australia. Their initial studies have demonstrated that patterns of productivity are profoundly different between the two regions. In general, Atlantic populations have levels of productivity up to five times greater than those of Pacific populations. In the field of nutritional ecology of herbivores, Bjorndal’s research on interactions among diet items as they pass through the digestive tract has resulted in a new paradigm by which diet selection and optimal foraging models can be evaluated. She is now focussing on the role of plant anatomical structure in diet selection by herbivores, which has been largely ignored. Bjorndal’s initial results indicate that this new approach could dramatically alter how we study the plant-animal interface and the current model of how herbivores perceive plants and assess their potential as food. Bjorndal has served on the editorial boards of two journals, edited six books and published more than 80 peer-reviewed papers. Bjorndal has served on two committees of the National Research Council of the National Academy of Sciences and served as chairman of the Marine Turtle Specialist Group of the International Union for the Conservation of Nature for 12 years.